It is a myth that buzz-free low action is always possible. People frequently read manufacturers’ specifications and assume those numbers are a goal rather than a guideline. They assume such a setup will suit their personal playing technique without any string/fret buzz. In my experience, that is just not the case. I’ll explain why. While fret buzz is sometimes due to an issue with the guitar (frets, neck relief, or string tension), the first and most obvious cause is simply how hard we play. 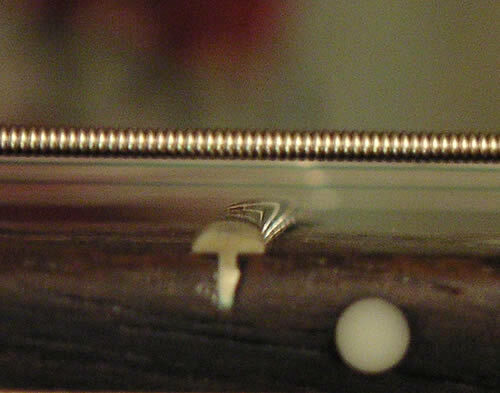 A light touch on the strings will produce a small vibration pattern. There will be adequate clearance between the vibrating string and the frets and so we won’t get any buzzing. If we play harder, the strings vibrate in a bigger arc and can temporarily vibrate on other frets, producing the ‘buzz’. Remember that no two people have the same hands and fingers. We each use guitar picks of different materials and thicknesses, and we pick at different points along the string. We can sometimes hear that very clearly when people play so it’s obvious that vibration patterns of the strings are different. That we can each get differing amounts of fret buzz is to be expected. What works for your favourite guitarist may not work for you, even with the same guitar. As an example, if I play with my fingers (i.e. no pick) I can get away with very low action without string buzz. But if I use a pick with that same low action, it’ll buzz like crazy. Of course, if I play with a clean tone any buzz will be more obvious than if I play with a distorted tone, which masks the buzzing sound. One problem in trying to eliminate fret buzz is the particular human condition of becoming ultra-sensitive to something when we pay close attention to it. The buzz can seem magnified in our heads, we become aware of the tiniest slightest unwanted noises and it drives us to distraction. It’s a sickness that afflicts many guitar players when doing set ups (and I call it Guitar Player Setup Syndrome). But when we focus on actually playing music, that persistent buzz may not be an issue at all. A few months back, I was doing a big string change, clean, and setup for a gig that I’d be playing that evening. I was getting really annoyed at a slight string buzz but I had to leave for the gig and couldn’t spend much more time on it. During the sound check and gig, the guitar sounded and played great and the buzz never bothered me. When I got back I re-measured everything. The guitar was just as I had set it up before leaving the house and it buzzed the same amount. When I wasn’t focused on it, it was barely audible (to me or anybody else) and not a problem. Of course sometimes we do have a fret buzz that needs to be addressed and there is a simple rule of thumb to help: if strings buzz on the lower frets (from the nut to the 7th fret) increase neck relief; if the strings buzz on the higher frets (from 12th fret to the end of the fretboard – raise the saddles at the bridge. This idea is discussed further in my two-part Truth about Truss Rods posts – part 1 and part 2. To conclude this post, we need to remember this – ultra-low action (below 1.6 mm [1/16″]) is just not possible for the most players without significant fret buzz. Even at factory specifications, some players’ technique will naturally generate some buzzing. It’s not necessarily a fault of the instrument and we need to realise that our personal playing style has a lot to do with it. Accepting that fact will make us much happier with our instruments and more realistic about what setup suits us best. We’ll waste far less time chasing the impossible and more time enjoying our instruments.